Honoring the neighborhoods’s past by transforming what exists today into a socially and economically inclusive community of residents, businesses, artists, makers, and visitors. 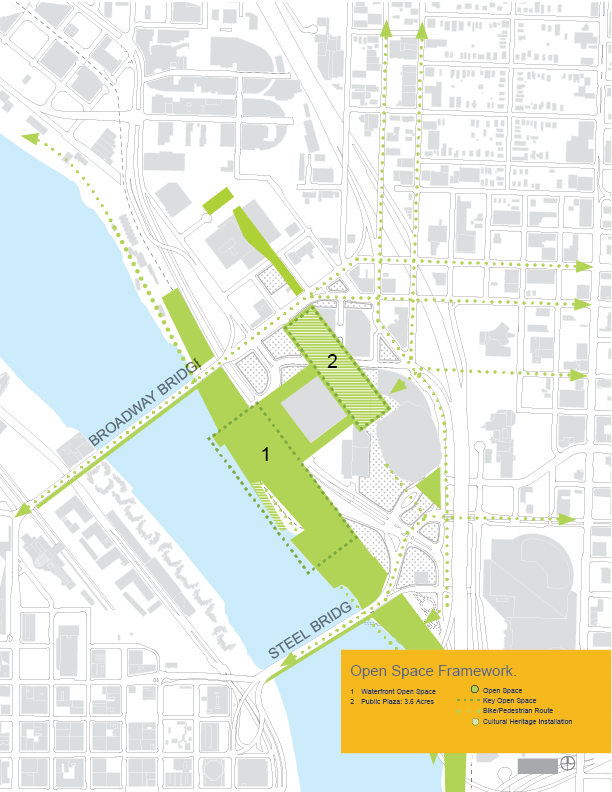 This vibrantly diverse community is anchored by intentionally conceived parks, plazas, combined with civic and cultural event spaces of different size and use, and is seamlessly connected to the river and its surrounding neighborhoods. We can’t call a place home until we’ve made it our own— added our touches—made it comfortable—made it functional—put out a few plants, some art, a fish, maybe a rug. Then we stand back, arms akimbo, proud, ready to invite friends and family over. Then we call it home. All of it. Portland. And the Rose Quarter falls under our home duties. We’re responsible for adding our touches to it and making it comfortable for ourselves and anyone who may join us for dinner. And as good homeowners with ninety acres of to-do-lists to tackle, we look at the Rose Quarter and ask ourselves the most difficult question-where should we start? Intimidating isn’t big enough of a word. There’s about 150 years of history is the Rose Quarter part of town and our job is to pay respect to it by creating an inclusive, affordable, vibrant, welcoming part of our home: welcoming parks, inclusive schools, vibrant churches, affordable housing, connecting with the river and reconnecting with a part of our home that is overdue for some love and attention, jeez, it’s a lot of work. But this is our home, right? The Albina community, which largely overlapped with the current Rose Quarter District, was once the cultural capital of Portland. It was a home to Portland’s black community, and a center of arts, small businesses, schools, and faith. Urban renewal in the 50’s and 60’s brought interstate highways, razing of neighborhoods, pushing the community further out from the city center. A vibrant community became a place to visit for events, but not a place to stay or live. Our opportunity is to honor the history of the Albina community that once was, while remaining focused on the brighter future to come. By restoring the name “Albina”, we endeavor to help bring back the sense of community to the neighborhood, as well as evolve its story. Public open space and access is central to our vision. This means parks, cultural, and event spaces that accommodate a range of scales and uses. Albina! is where you meet for a one on one chess game, a 5 on 5 basketball game, and to participate in the City’s largest gatherings and events. You come to Albina! to inspire and be inspired. The outcome will be the City’s front porch. In regenerating a neighborhood we will integrate nature, utilizing and exposing environmental systems. We will re-knit the area to adjacent neighborhoods and bring people to the river. The outcome will be an environment and experience that sets a new standard for responsible urbanism. Replacing the displaced the heartbeat of Albina. We will acknowledge a diffi cult past as we aspire to reintroduce a neighborhood to this place. In a time of deep need, our vision is fueled by intentional and large-scale affordable and workforce housing. The outcome will be a diverse and resilient community. Over the course of six months in early 2015 a wide range of engaged citizens and community leaders came together through work sessions and vision exercises to articulate their values and develop a physical framework for the future of Albina. These advocates of the city were given no specific development agenda and were free to establish their own standard of a successful outcome. From this combined knowledge of Portland, urban development, finance, history, and local communities, grew a holistic vision for an emerging Albina District. Following this initial effort, the vision has been carried forward largely by volunteer members of the initial working group supported by various professionals lending their specific expertise. As a framework vision, this is a living idea that will continue to evolve through the collaboration of a wide range of community leaders, citizens, local and state government organizations and a wide range of professionals including developers, architects, engineers and planners.